Congratulations! You are now the proud owner of a Sugar N Spice costumes fursuit. But with great fluffiness, comes great responsibility. Fursuits, while being constructed for hours and hours of jumping, romping, and cuddling, can still be fragile if not cared for properly. Remember that these are hand-made costumes that require extra tender-love and care. Fursuit maintenance starts the moment you take them out of the box! You can try your suit on fresh out of the box, but there are a few maintenance tips we recommend you follow! Check for any damage to the box to be sure it did not get wet, crushed, or otherwise damaged, as it may have put damage on your suit. If there are no damages, remove the fur suit. Be sure to leave the head and any other padded pieces in an open, well ventilated area so that it can regain any shape that may have been lost or distorted in travel. This may take 24-48 hours. Brushing. Something that needs no forgetting before, during, and after suiting! Brushing keeps the fur from getting matted and helps clean debris trapped in the fibers. Areas like the underarms, crotch, and thighs may need more brushing than others due to extra friction. You can brush anything that has fur! But be careful around areas that include fleece or plastic, as the brush may scratch the other materials. Any place dark and damp is a breeding ground for bacteria and mold. Remember this before you put away your head, hand paws, feet paws, or any other prop that may harbor yucky hitchhikers. Leave your head to dry before putting it away can help prevent unwanted smells and damage to the head. Propping it up in front of a fan will do. Brushing your bodysuit out entirely and leaving to dry will also promote the longevity of your suit. Remember: just drying won’t kill mold, bacteria, or get rid of any stinky smells! We recommend making a natural disinfectant (recipe below). This will ensure there be no skin irritation or foam degeneration later. When leaving your head to dry, give it a few sprits inside with the disinfectant mixture. Turn your bodysuit inside out and do the same. Focusing on the underarms and crotch, especially. 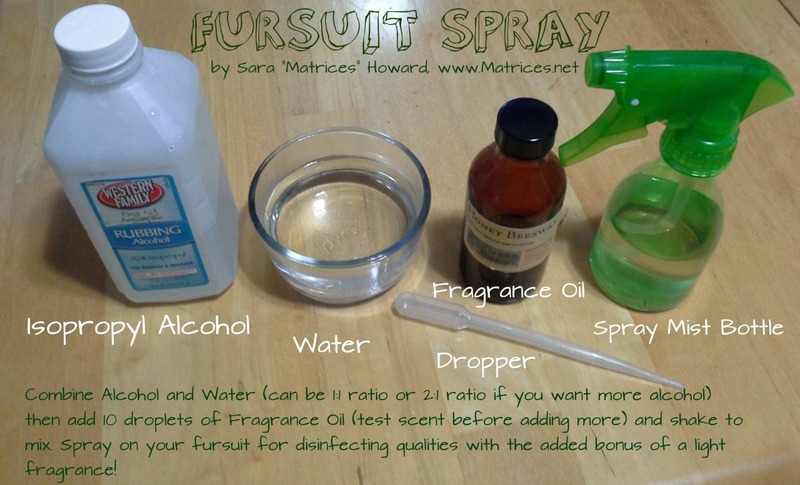 You can also open the cuffs of your hand paws and feet paws and give them a spray, too! It is important to wash your suit after heavy suit outing or conventions. Sometimes you just want to smell nice! Fursuits, like clothing, require different washing instructions. If you are unclear, please message us and we will give you a more comprehensive guide. Before washing your suit, you will want to turn it inside out. If your bodysuit has an attached tail or any form of padding, your suit will benefit from being washed in the bathtub. Use laundry detergent as the soap, as you would with any clothing. When you are done washing, you can hang your suit to dry, or dry it in the dryer on a tumble setting (NO HEAT.) Be sure to periodically brush the fur out so it does not clump. Before storing your fursuit, be sure to brush out all fur and turn the garments right side out. Feetpaws, handpaws, and tails do best with spot treatments and a gentle scrub in the sink. >Dry your suit in the dryer on a heat setting. It WILL melt the fur. Note: While fabric softener will soften the backing on the fur and make it softer, it can also take the shine out of the fur.We advise using half of what you would normally use. It is recommended that fusuits are stored in a plastic tote box. They can be purchased at Home Depot, Target, Walmart, and other department stores. They are usually under $20! When storing them, be sure that they are completely dry and clean. Be sure the suit is not twisted up or thrown haphazardly into the box- for it can kink the fabric. Fold your bodysuit neatly and lay hands, tails, and feet flat. It is not recommended heads are stored in the box- but can be if they are given enough room. When traveling, parts like hands, bodysuit, and tails are safe to vacuum seal for brief periods of time. When traveling, keeping a note in your luggage to let the attendants know how to put it back in the box is recommended. Mark your luggage with “Fragile” tags and a brightly colored ribbon so you don’t lose it and it is handled with care. Good hygiene goes a long way. Be sure to bathe and use antiperspirant before wearing your suit. Wearing Under Armor or lycra bodysuit under your suit will prevent it from soaking up a great deal of sweat. Just because you are not stinky, does not mean your suit won’t pick up the smells of those who touch it! Avoid eating food in fur suit or handling materials that may spill or stain the fur. Snap, crackles, and pops happen. Until we can have our hands replaced with robotic sewing machines, there will always be delicate parts of suits that are susceptible to tears after wearing. Not all repairs are needed to be shipped to us for completion. Some can be repaired right at home! If you are curious about in-home repairs, message us and we will walk you through the process. Should you wish to send the suit back for repairs, pleasure review our Terms of Service for our current policy! Have someone help you into your suit if the zipper is in the back, as zippers can be delicate! If you notice any loose threads, cut them with scissors, Do Not pull them! Should you want to make any alterations to the suit- please contact Us via FurAffinity, email, or otherwise! Any additional questions? Contact us! The closer you follow this guide, the longer your suit will last! A clean fur suit makes for a happy fursuiter. These costumes take weeks to make, and should last the owner for years. Treat your character with the love and respect they deserve!